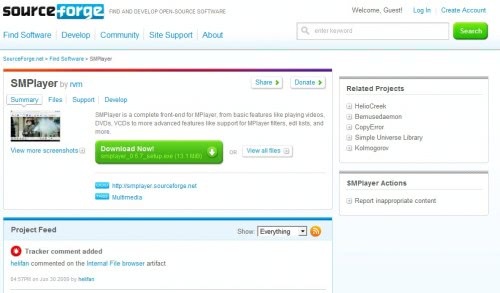 Sourceforge is a website that allows developers to host their Open Source applications on it. Sourceforge hosts some of the most prestigious Open Source applications on their website including 7-zip, Emule, Notepad++ or SMPlayer. Sourceforge hosts these Open Source projects which basically means that the developers have the means to create websites for their software programs, offer downloads, discussions or bug tracking. Many users felt however that the Sourceforge website was hard to navigate and looked kinda outdated. Lucky for them that the website was redesigned lately. It is not really clear when the changes went life, neither the blog nor the homepage contain information about the redesign. The Sourceforge homepage looks very user friendly. A prominent search form, categories, popular projects and other services have been placed cleanly on that page. Changes have also been made to the project pages which make it now easier to download the Open Source software from the Sourceforge website. The project owners have still all possibilities to change the default homepage to a unique project homepage. Designs have been taken over from the old website. The new website is definitely easier to navigate. Thanks to Yansky for submitting the news. What's your opinion about the new Sourceforge homepage? Update: Sourceforge was recently re-designed again and the site looks different again. The main page lists for instance the number of downloads, code commits, forum posts and other stats, the available categories that projects are posted in on the left, and a selection of projects of the month in the middle. The project pages have not been modified on the other hand and are still displaying like they did before. You caught it fast. :) I was browsing some stuff there ~3 hours ago and it was still old design. Well this is welcome and long overdue. I have found the site design unintuitive. I tried to check out the new design and get “Error 500”. Looks like I am not the only one who is now curious. Apparently they broke some links during the upgrade! wow. about 10 years overdue, but so welcome! Well they have been in transition to new design for a few days now, and they still haven’t completed it all. Personally, I like it. Also I believe that basically it’s the same theme, they just changed from grey-orange to white-blue, but the functionalities are the same. Navigation is a bit easier. It took some time to figure out where the old links and menus are now. Personally I was pretty happy with the old design, and at first look don’t see anything positive in the new one. SF already had a redesign a year ago or so, when they switched to the gray/black/orange theme. I remember there were many users complaining about the changes, including me. However, step by step the SF team responded to the critics and thus the gray/black/meanwhile-much-less-orange theme finally (i.e. until June) reached a state I was very comfortable with. It seems they made some improvements to the home page and navigation, which I are welcome — but am I the only one who thinks it looks like the Web 2.0 fairy dropped just a little too much pixie dust all over the site? It’s like a pastel color explosion. I also think it is a bit to much pastel, but others may like this and I think I can live with that. You say it seems navigation has been improved. I don’t think so. As a developer you always have to click the Develop button to see some development related extra links. This is annoying when switching between development and standard pages. Additionally now it needs more clicks to get to the statistics page and I did not find a link to get to the news submission page – I still use an old bookmark for this. Partially the side is exactly the same as before, just using different colors, partially it seems to “try” a new navigation concept .. working on the SF site is a very inconsistent experience. Not to mention the various site bugs related to the design switch (just browse the SF support tracker). SF still is the most flexible and open platform for FOSS publishing. I wonder how a team experienced in operating such a huge platform is able to produce such a conglomerate of issues. It seems the redesign broke the way I use my download manager :( I usually drag the links to my Free Download Manager hovering dropbox. Unfortunately that doesn’t work anymore (probably a cookies issue). Not a huge of the redesign at all. It hides way too much information, and it’s a pain getting to what you need. The ‘Develop’ button being a prime example, as mentioned in an earlier reply.